Whether you are motivated by saving money or if you’ve just always wanted to learn how to take care of your own vehicle maintenance, it’s a good idea to at least have some basic tools at home in case you need to make some minor repairs. Old cars, new cars – the basic design and requirements for regular maintenance is the same. 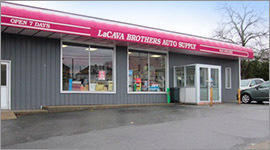 You can get all of the Fall River auto parts and services you need at LaCava Auto Supply. As an auto parts store that has provided quality services and brand name parts to customers for over 70 years, LaCava Auto Parts has a broad range of options with regard to parts, accessories, fluids, services, and more to ensure that we have everything you need to get the job done right. 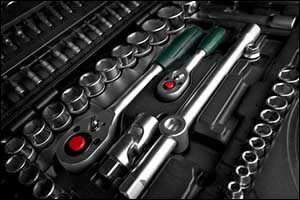 Socket Set – Depending on the make and model of vehicle that you have, you might require either a standard or metric size of socket set for home repairs. However, there are socket sets that provide both options in one kit, which is great for multi-car homes or so you can make sure you’ll always have what you need for vehicle or home repairs. Socket sets are used for lots of things, such as changing out tail lights, turn signals, and other important safety features. The best part is that a socket set is easy to use, whether you are a beginner or if you have a lot of experience making minor repairs. Torque Wrench – One of the most common mistakes made by new home automotive mechanics is not setting the nuts to the proper torque. Tighten them too loose, and they could come off and cause mechanical issues. Tighten them too tight, and the bolt could shear off, making it extremely difficult to remove again in the future. A torque wrench that has a clicker can help you to make sure you are tightening the nut to the proper specifications. Follow the instructions when you purchase a torque wrench at your local Fall River auto parts and services center for best results. Ratcheting Wrenches – A good wrench set is extremely valuable to any home toolbox, especially if you are going to be doing regular maintenance on your vehicle. LaCava Auto Parts carries multiple options for wrenches that be used to get the job done. Whether you prefer ratcheting wrenches or open-ended wrenches, we can help you get the tools you need at our local auto parts store. Pliers & Wire-Cutters – Electrical maintenance and repairs require the use of a good set of pliers and wire-cutters. Other installations will also require these tools, such as putting in new headlights or adding speakers for a new stereo system. Depending on your vehicle and the type of work that you will be doing, you may need various sizes of pliers and wire-cutters for your project. Our Fall River, MA car parts and tool store should have everything you need to complete your kit. Screwdrivers – Perhaps one of the most universal tools required for vehicle and home maintenance, it is important to have a good set of screwdrivers. Make sure that you have standard and Philips head screwdrivers, so you’ll be covered regardless of the situation. A complete set should also include a large and sturdy flathead screwdriver, which can be used in multiple ways. Tiny screwdrivers will be needed for electrical work. Choose a set that will provide you with the options you need from our auto supply in Fall River, MA. A Good Work Light & Gloves – Safety is important, whether you are working in your home garage or on the side of the road. Make sure that you have a good working light. Consider getting a quality plug-in light that can be used in the garage, as well as a bright outdoor light for the driveway or on the side of the road. Gloves are extremely important as well. Take your time and investigate the options available at your local LaCava Auto Parts Store in Fall River to ensure that you have the most appropriate style and type for the work that you will be doing. If you are searching for a specific tool or part, make sure to visit LaCava Auto Parts or give us a call at 508-676-1951. If we don’t have it in stock, we can get it for you. Family owned and operated, LaCava Brothers has provided top quality Fall River auto parts and services for over 70 years. We take pride in the work that we do and the quality products that we sell. We provide professional services and even offer certain free services to our customers to help them keep their vehicles in good running order. Call today to check our hours or stop by our location on Bedford Street in Fall River. You can even use our Parts Lookup tool on our website if you need information on a specific part after hours.